There is no technology company in the world quite like IBM. Its history dates back to 1889 and perhaps no other technology company has been through as much and reinvented itself as many times. IBM is synonymous with innovation. It produces more patents than any other technology company in the US and it owes much of its success to its focus on R&D. Thus, it’s no surprise that a company like IBM would develop a teleportation system. There’s only one problem – IBM’s teleportation is not real – it’s virtual. That’s correct. The company known as the world leader in supercomputing teamed up with Second Life to make sure that users of virtual worlds can “teleport” their avatars between them. By most measurements, virtual worlds like Second Life have not yet caught on, despite the hype. The NBA, which entered Second Life in May 2007, had only 1,200 visitors to its island by July 2007. But that paltry number didn’t faze NBA commissioner David Stern because he was told “that’s very, very good” and in any case, “we just want to be there“. And who can blame him? After all, where else can you find so many NCLs (naked conga lines)? Putting aside all the futuristic notions about a 3D internet that we interact with much the same way we interact with the real world, the marginal popularity of Second Life and virtual worlds like it makes it difficult to justify why a company like IBM would, at this time, invest in a “joint development project” with Linden Lab to enable users to teleport their avatars between virtual worlds. Yes I know. IBM employs nearly 390,000 people and an executive with the title “Vice President of Digital Convergence” needs something to do. But I couldn’t help but think that the Linden Lab-IBM announcement was emblematic of the state of the technology industry today. While companies like IBM are still doing groundbreaking research in important areas, it just seems like there’s an increasing trend of more effort being made in clearly unimportant areas too. To be sure, every era in the history of computer technology has seen its fair share of investments in less-than-useful endeavors. But it’s the willingness of so many leaders (like IBM) to participate in today’s never ending string of flavor-of-the-month technology fads that leaves a bad taste in my mouth. I’d hope that the minds at IBM know what they’re doing on this one but I “think” IBM’s project with Linden Lab is a waste of time for such a prestigious company. I hope IBM proves me wrong and on second thought (no pun intended), if it could somehow invent a teleportation device that transports a real human into Second Life as an avatar, that just might be very worthwhile. I’ll have to send that idea to IBM’s Vice President of Physical-Digital Convergence. 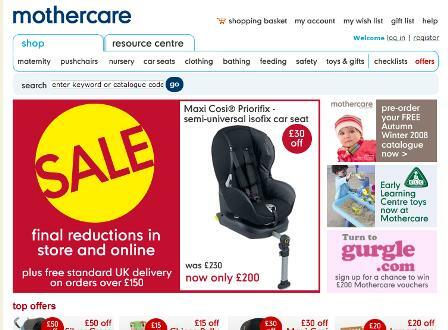 Mothercare’s online sales have risen dramatically over the past financial year. They reached a total of £85.5m, an increase of 78% on the previous year. running alongside the old one. It has a bigger, bolder look, but is it an improvement on the old version?